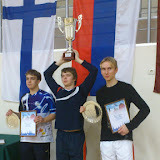 13th Riga Cup was held on December 3, 2010, at Riga's High school of Cultures (Ganību dambis 7, Rīga). There were 140 players from 8 countries. Based on results in OPEN, the best 3 ladies/veterans/juniors were awarded with Cups.